I grew up in Altoona, a railroad town nestled between Wopsy and Brush Mountains in Central PA. I didn’t make crafts or do needlework. My neighbor did embroidery and crochet and taught me to embroider. I was fascinated with the beautiful items produced with a piece of string and a stick with a hook on the end. I tried crochet but couldn’t seem to catch onto it. In high school, I took sewing classes and art, and I made some of my own clothes. This is what started me on the path of expressing myself through fiber. In the early 70’s, I decided to learn to crochet. By that time, I was married and had an infant son. While he napped, I crocheted. There wasn’t a local yarn shop or craft store, and of course no internet or YouTube. I bought some Red Heart yarn (that’s before I became a yarn snob), a crochet hook and several “how to” books from Kmart. Armed with these supplies, I started a journey that would become a lifelong passion. Picture this: I sat on a kitchen chair with yarn and hook in hand and spread out my books on the floor. Looking at the illustrations and reading the directions, I diligently worked to teach myself. Not only did I learn to make the stitches, but I learned to read the patterns. I started purchasing magazines and books about crochet and made many, many projects. Scarves, hats, sweaters, toys, etcetera: you name it, I have probably crocheted it. Not only has crochet provided pleasure in an accomplishment, but it has been therapeutic. During tough times, I sat down with my current project and relaxed into my “crochet world”. Everywhere I go, my crochet goes. too. When I go on a trip, my crochet bag gets packed first. There are very few days that I don’ t crochet at least a couple of rows on one of my several projects. Back in the early 2000’s I taught crochet at a local Michael’s. One of the staff members brought me a sweater and asked if I could duplicate it. Though I read patterns very well, I had never made anything without one. Remembering the saying,” You can’t walk on water, if you don’t get out of the boat," I told her “yes”. That was a real turning point for me. The freedom to express myself creatively has truly moved me forward with my crochet. I enjoyed the flexibility of not always needing a pattern, and it was then that I started designing. I enjoy designing bags/totes, children's animal/character hats, purses and scarves. I create special order items such as shawls and christening gowns, as well as various items for other occasions. My process for constructing an item is as follows: idea, plan, design, and THEN it can be put together. All of my products are constructed with either 100% cotton, machine washable wool or acrylic yarn(which makes them more durable), and they are machine washable and dryable on delicate. All of the embellishments are either beads or buttons (I don’t use felt or shells as they won’t hold up when washed). Each item is handcrafted by Paulette’s Panoply. 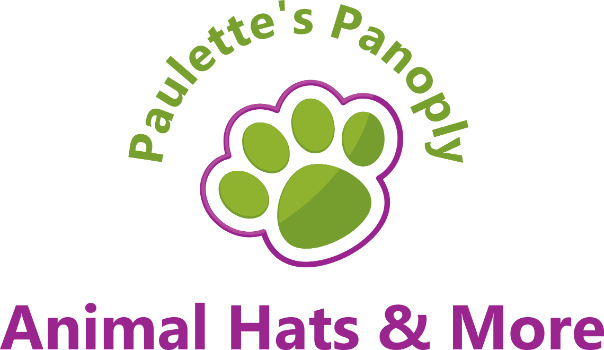 Paulette’s Panoply was started in 2010 with the goal of having a virtual store when I retired. I chose panoply because it means “an amazing array and display”. Paulette’s Panoply, "an amazing array and display" of animal hats & more; quality products for the discerning buyer.